Does anyone have a spare Olympus BH2 Objective Turret in the bit box which is not operational/broken please? All I need is the rectangular dovetail to act as a template for a part on which to create a single lens mount for a vertical rig. Alternatively is there anyone who has one and can accurately measure one for me so that RAF can work from these dimensions? Years ago I bought a stand with a big table/movements designed for Si wafers. There was a fellow here a while ago who I'm sure could machine such a thing.... if anyone comes up with dims. 4.5 thick, 30° angle with 1mm not angled. screws 24 x 21.4 ish centres. Female at tightest (front) point is 27mm. I don't know if that's the same as the other scope, this is a BHMJ. I will check with my stand. I think our stand heads are a different in certain respects based on what I could measure confidently on a comparable basis to your measurements. I've edited a bit, one dim was wrong. Mine's a little shorter/ smaller diameter, but the dovetail is the same. I expect they're meant to be the same, though if one goes in to the slot less far?? Mine's 11.5 radius difference between the outer and inner curves. If I find another I forgot I had, I'll let you know! I should not rule out some small variations left by my very old manual measure. Based on this it would seem that we are both dealing with the BH2 BHT (4 screws). If I get hold of a spare dovetail sled I will send it to RAF. What sort of lens mount would you have in mind? Well, there's 25.44mm between the top side of the dovetail and the objective mount flange, so there's some room for adapters. I don't know if my other scope stand referred to, is one of those other standards. I'd think of accommodating a range of bits and pieces. Even Mitutoyo is too big though - the narrow face of the dovetail plate is about 26mm wide. M42, obviously bigger than the dovetails, would be a useful thread to work from if you wanted to get a tube lens in there, say. 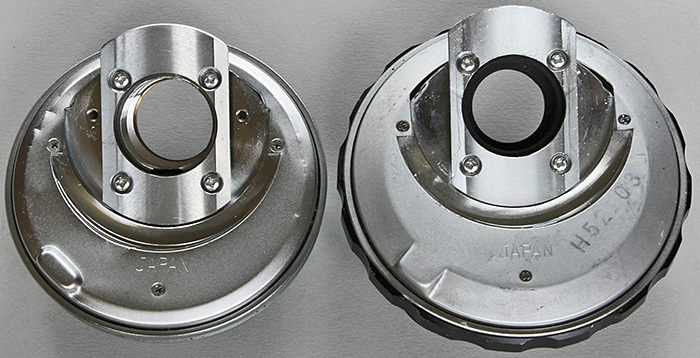 There are adapters for 26mm to rms, for example. OTOH if you want parfocality with other Oly stuff you'd need to respect the exact 25.44mm, I expect. I have seen things like this made at the Makerspace I use, but I don't know what the CAD program is. Thanks Chris and especially the "25.44". My own choice would be to specify M42 like the MM-11 mount prototyped by Smokedaddy. I shall probably ask RAF to machine up a whole new adapter from the a sledge template. When I have a spare that is. Just nitpicking, but the BHS, the BHT and the BHM (and the BHA version of the BH) all take nosepieces that slide in on a rectangular dovetail. The CH-2 takes the same nosepieces but attached by 4 screws; there is no dovetail. 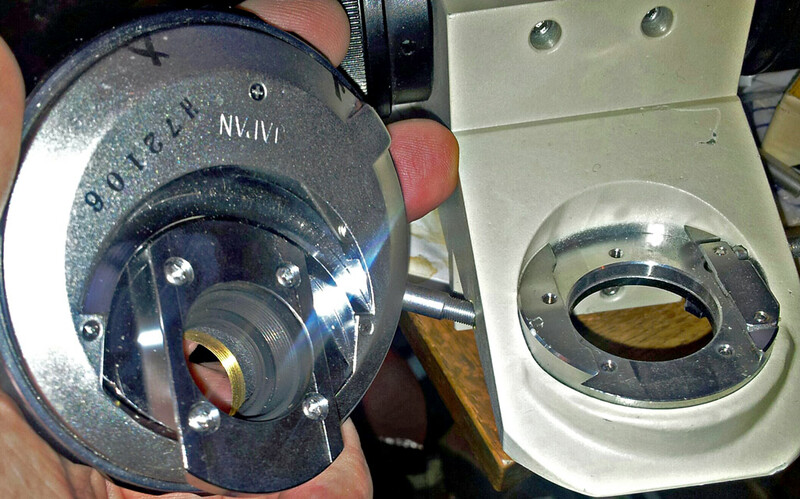 I replaced the original 4-way nosepiece on mine with a 5-way one after removing the dovetail. Sorry, I don't know where the dovetail is now. Not all nosepieces will fit a CH-2, they need 2 extra screw holes to left and right of the dovetail. From what I can see........no it is not the right version. Whilst I have not secured a spare nosepiece or sled yet I have dropped an email to Raf to see if it is something he can fabricate.